Ah, the “time slip” novel. A bit of history for education, a bit of the modern-day for relatability, and a bit of mystery to keep you going. I can see why these novels are popular. It’s a perfect formula, and I find the concept nearly irresistible. But, alas, only Possession by A.S. Byatt has managed to fully satisfy me. Until now. 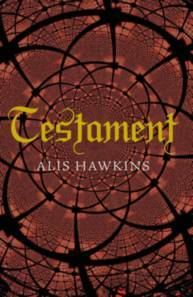 I mooched a copy of Testament by Alis Hawkins purely on the strength of Juxtabook’s enthusiastic recommendation. Of course, with over 200 unread books in the house, my acquiring a book only slightly increases the odds of my reading a book. But then I saw that this was going to be the Cornflower Book Group choice for January, and I decided to move it to the top of my stack. And the blogosphere did not fail me; this is a wonderful book. The modern-day storyline in Testament is set on the fictional campus of Kineton and Dacre College. A small fire in one of the campus’s oldest buildings has revealed a mural hidden behind the wood panelling. Damia Miller, the college’s marketing manager, realizes that this discovery is the just the thing the college needs to garner alumni and community interest. Through blog posts and e-mail blasts, she galvanizes friends of the college to assist in uncovering the mystery of the painting and in supporting the college for the future. The historical storyline is set in the late 14th century, when master mason Simon of Kineton is beginning work on the college. His wife Gwyneth, a master carpenter in her own right, has just given birth to their first son, and the family is hoping for a bright future. But it’s an unstable time, and their loyalties to each other, to their son, and to God are tested. In the background are controversies about fair treatment of workers and the progressive new ideas of the Lollards, an anti-clerical movement that pushed for church reform and the translation of the Bible into English. Most time-slip novels that I’ve read don’t quite work for me. They often do a nice job with either the past or the present, but not both; or they have two reasonably effective stories that don’t come together. Hawkins, however, handles both storylines beautifully, and she crafted a single coherent storyline out of the two threads. The modern-day storyline offers a strong central character who is intelligent and three-dimensional. By making Damia a marketing manager rather than an art history researcher, Hawkins gives her a stake in the proceedings but doesn’t give her so much knowledge about the 14th-century that she’ll be too far ahead of the typical reader. It’s a clever way of handling the problem of needing to fill in gaps in readers’ historical knowledge without making her heroine too dense to be appreciated as a character. Damia needs to have some history explained to her because it’s not her area of expertise, but she catches on quickly and is even quicker to see the implications for her marketing and fund-raising campaigns. Hawkins also gives her a history and some personal struggles that make her feel real. I liked her. I also liked the historical characters. There are a few points in the history that don’t feel quite authentic. The fact that Gwyneth is a master carpenter isn’t exactly believable. I haven’t read enough about the era to know whether women did take on such professions, but even if they did, female carpenters were no doubt rare, and I was surprised that the characters seemed to take it in stride. There are also some quibbles I would make about the Lollard theology of the characters. I haven’t read extensively on Lollardy; it was mentioned only in passing in my Medieval theology class and only gets a paragraph or two in my textbooks. Hawkins gets the broad outlines right, as best I can tell, but her characters express some notions, particularly regarding original sin, that don’t quite ring true based on what I know of the Lollards’ influence on Lutheranism. This is a minor point, and the character who most clearly expresses the views that I’m questioning was not a religious scholar, so his views wouldn’t necessarily represent anything other than his own independent thought—and he had strong reasons for adopting his position. That said, I was impressed with Hawkins’s characterization of 14th-century people. They may not be authentic to the 14th century, but they certainly don’t feel like people of our time. She allows some of them to express views that would be terribly offensive today, but she doesn’t turn them into villains for it. I was delighted to spend time with them. And the pacing is excellent. Hawkins dribbles out tantalizing bits of information about the past that allow readers to reinterpret the art discoveries as they go. Sometimes the readers pull ahead of the modern-day characters. Sometimes we stand alongside them and make discoveries with them. It’s obviously plotted with care. I enjoyed it thoroughly and hope more readers find it. It’s what I want and hardly ever find when I reach for this kind of book. 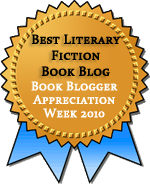 This entry was posted in Contemporary, Fiction, Historical Fiction. Bookmark the permalink. Jenny, I think you would like this. It’s really well done. And I *will* read Connie Willis. I have To Say Nothing of the Dog and do want to get to it, but everything else intervenes. Connie Willis’s short story, “Chances,” is one of the best (and saddest) I have ever read. It was in a collection of SF stories written by women, but the story itself has very little science fiction and so much about living with the choices we make. If you want to dip your toe in, that would be the place to start. Jenny: You said it! I *want* to love every book like this that I hear about, but I’m almost always disappointed. I don’t necessarily jump at historical fiction, but I admit the premise of this book is pretty intriguing to me. I might not have quibbles about historical accuracy and the like, but I also tend to have issues with parallel/multiple storyline novels. Inevitably I find one storyline more interesting or compelling than the other and its the rare novel where I find each equally strong. This sounds like it could be a contender, so I will mentally flag it (since I really am doing my best not to accrue more books!). Steph: I found the modern storyline very very slightly more interesting, but this was a rare parallel storyline book where whenever the switch was made I was hungry for more of the storyline I just left. This sounds really interesting. I’m usually far more interested in the historical sections of books like this, mostly because I find that is where the most research and effort has been put in, with the modern storyline serving little purpose (aside from the purely structural). However, I’m strangely intrigued, knowing that the modern character is a marketing manager. Perhaps it’s the randomness, but it intrigues me nonetheless. Claire: I usually prefer the historical as well, but as I said to Steph, I actually liked the modern ever so slightly more here. And I loved that the main character was in marketing rather than historical research. It was a nice twist on a well-worn concept. I don’t like time travel novels much, either. But this sounds like it might be a good one to try! Aarti: FWIW, this isn’t a time travel novel in the sense of people going back in time, although I would consider some time travel books a specific subcategory of the “time slip” novel. At any rate, this book does avoid lots of the problems I’ve found in books attempting to cover two time periods. If you do read it, I hope you enjoy it! This sounds intriguing, and I think I saw it in a book shop a few months back. Hmm, I’d try it if the right moment came up! Oh-this sounds like so much fun!